Reward Points: 0 0 points = S$0.00. The Freewell Gear DJI Mavic /Phantom Series Compact Landing Pad is ideal to ensure that your Drone always lands safely. The DJI Mavic /Phantom Series Compact Landing Pad is designed using the highest quality PU-based material, making it excellently durably as well as lightweight. The Compact Landing Pad has been tested effectively for being waterproof and able to withstand extreme weather conditions efficiently. The increased size of 75 cm x 75 cm means increased safe landing space for your Phantom series, Mavic 2 and other such larger drones to get back on ground. The bright, reflective printing is excellent for additional visibility, especially in low-visibility weather conditions, such as in misty and foggy conditions with a general low lighting. The Freewell Gear DJI Mavic 2 Compact Landing Pad is designed for safety and efficiency, hence it is easier to deploy and store as well. Not only is the Freewell Compact Landing Pad an excellent accessory for the DJI Mavic 2 series drones, thanks to its large (75 cm x 75 cm) size it is suitable for use with the DJI Phantom series drones, as well as other similarly larger-sized drones. Size – Comparatively larger size - 75 cm x 75 cm – is suitable for a large variety of large-sized drones, such as DJI Mavic 2 Zoom, DJI Mavic 2 Pro, DJI Phantom 4 Pro V 2.0, DJI Phantom 4 Pro, DJI Phantom 4 Advanced, DJI Phantom 3 SE and other similar sized drones. The large size offers significant visibility through your drone camera and offers safe landing of your expensive drone at all times. Material – The Freewell Gear Compact Landing Pad is made from only the highest quality PU. It is not only impressively strong and flexible it is also completely waterproof too. This makes the Compact Landing Pad an excellent accessory for use in rough weather and tough terrain. Weight – The Freewell Gear Compact Landing Pad is naturally lightweight and weighs a mere 38 oz. This makes it efficient to carry it when flying outdoors. It fits perfectly in your Backpack Carry Case, and you can barely feel its weight. Print – The Freewell Gear Compact Landing Pad is made for optimal visibility. Thus, it has a distinctively bright pattern printed on its landing surface. This makes it easy for the drone camera to spot it, even in dreary, low lighting conditions. This is an important aspect of the landing pad in ensuring your large, expensive drone always land safely. 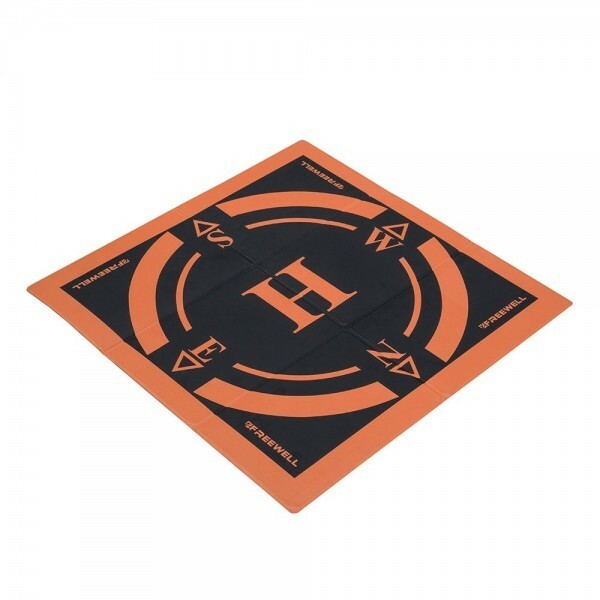 Durability – The Freewell Gear Compact Landing Pad is made from an extremely durable material. The unique fiber material is able to withstand extreme weather, hot and cold. On top of this, it is extremely resistant to wear and tear, unlike the commonly found landing pads of lesser quality in the market. Portability – The Freewell Gear Compact Landing Pad is ideal for efficient portability. It is easily foldable for faster deployment. After use, it can be easily folded into a significantly smaller size and stored conveniently in your drone’s accessories carry case. The Freewell Gear DJI Mavic 2 Compact Landing Pad is an excellent solution for ensuring that your valuable Mavic 2-series, Phantom series and other similar-sized drones always make a safe landing, in all weather and lighting conditions outdoors. DJI Mavic 2 series of drones has become immensely popular in a short time. With an advanced camera and increased performance the Mavic drones from DJI have been helping cinematographers capture the most stunning aerial videos and photographs. Freewell Gear is always prepared to help the thousands of loyal DJI drone users with a list of essential accessories. The DJI Mavic 2 Compact Landing Pad from Freewell Gear is one such necessary accessory for aerial photographers and amateur drone fliers alike. As commercial drones become more advanced, they become more expensive, and hence additional security is always welcome. Using the Freewell Gear DJI Mavic 2 Compact Landing Pad you can now fly without fear knowing that your Mavic 2 drone will always have a safe takeoff and landing, in all weathers and terrains.